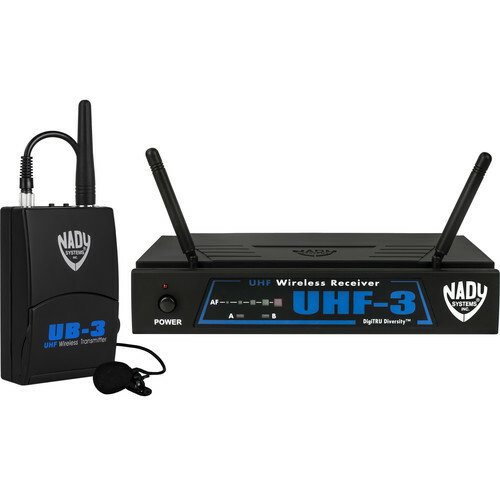 The Nady UHF-3 UHF Wireless Lavalier Microphone System incorporates stable UHF reception in a cost effective package for DJs, presentations, houses-of-worship, karaoke, and much more. The UHF-3 avoids the crowded VHF bandwidth, resulting in low noise and fewer drop-outs. The system is straightforward and easy to operate, with the UB-3 bodypack transmitter, lavalier microphone and UHF-3 receiver. The bodypack transmitter and lavalier microphone provide reliable, hands-free microphone operation during presentations, sermons, performances and more. The receiver features DigiTRU diversity technology for stable reception. This system includes a lavalier microphone. A headset microphone is optional. Box Dimensions (LxWxH) 11.9 x 11.1 x 2.4"